The true measure of any luxury jewelry piece lies in its versatility; can it be paired with a little black dress for a formal event, as well as a designer blouse for a more relaxed evening with friends? 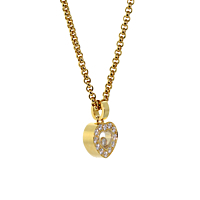 Chopard offers its own answer to those questions with this stylish 18k Yellow Gold Happy Diamonds Necklace. From the convenient 16" Necklace length to the gleaming Diamonds themselves, this piece offers everything a discerning lady could want - and with all the grace and artistry that Chopard is known for!